When you are on a contact record and you click the Previous or Next Arrow it will take you to the previous or next contact in the contact list filter. We’ve now added this for the contacts you click from the Rolodex. We have created a new search in the Advanced Search options. 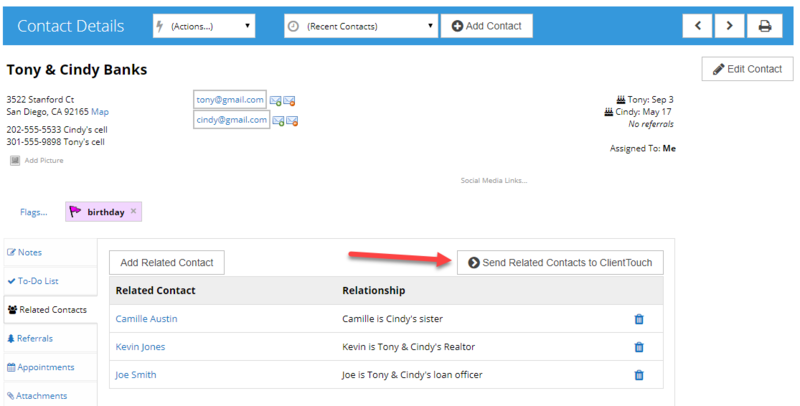 You may now search for contacts that have never been assigned a specific Autoresponder. Look for Never Assigned This Autoresponder in the search drop down. In the Settings, To-Do Plan page, we’ve added the option of deleting a plan from the main list with the trash can icon to make deleting plans easier. You wanted to be able to work with your Related Contacts as a group. You can now add the group to ClientTouch from any one of the Related Contact’s records. You wanted to be able to work with your Referrals as a group. 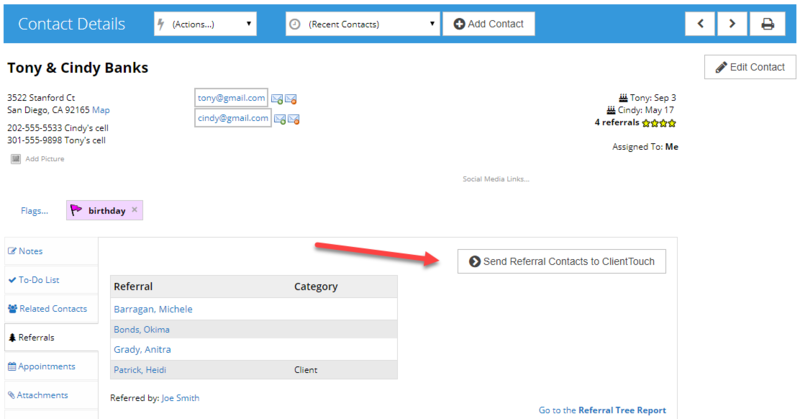 You can now add a contact’s referrals all to ClientTouch from the Referrals Tab on the Contact’s record. If you are using a template to send out an email, the template name and subject will now be included in the contact note about the email. If you do not use a template, you will continue to see just the subject. You may now use the other email to search for a contact. Learn more on this developer blog post. You may now choose to use our phone number labels or import your own. Learn how on this knowledge base article.